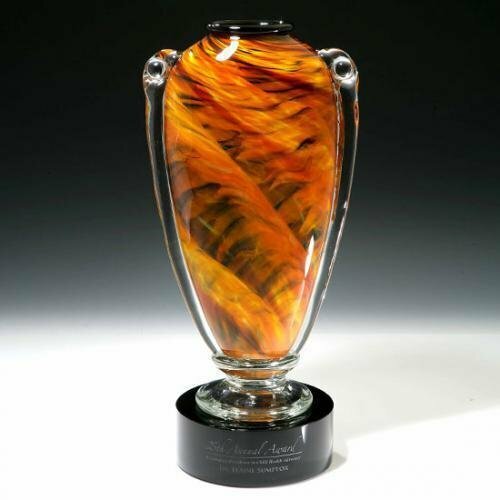 Dazzling art glass awards are anything but ordinary! Because each art glass award is hand blow no two are exactly alike. 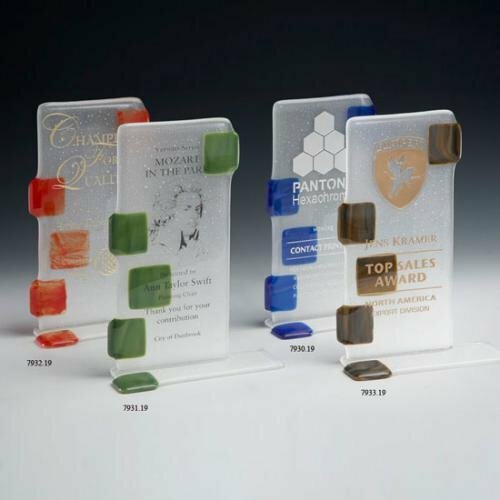 The smaller art glass trophies create exciting appreciation gifts, while the larger acrylic art awards and plaques are perfect for corporate awards and recognition, serving as memorable retirement awards for valued employees. Laser engraving is setup for the base of the art glass award by our design professionals. Browse the Artistic Awards gallery for an explosion of color and style. Elegance and grace highlight this beautiful Blue Water Glass Art Sculpture. The vibrant and striking colors along with a stunning tear drop shape make this an incredible piece that anyone would be proud to either give or receive. Sitting atop a glass base this product is available in three heights 7 1/2", 9 1/2", and 11 1/2" giving you plenty of choices for your award needs. Stunning shades of red are used to create the look of fire that sets set this Corporate Red Fire Glass Art Sculpture apart from the crowd. The elegant swirling shape provides a stunning look that will please any recipient. Sitting atop a glass base this product is available in three heights 10 1/2", 12 1/2", and 14 1/2" giving you plenty of choices for your award needs. 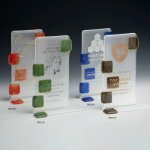 The Quartz Cut Sculpture acrylic awards are beautifully crafted from the finest acrylic. Their unique diamond like design is sure to catch the eye and make a fine addition to anyone's trophy collection. Available in your choice of blue, red, green, gold or purple reflective bottom and Available in six different sizes! The Spectrum Award is beautifully crafted from acrylic and features a beveled triangular shape with a unique rainbow reflective bottom that is sure to make heads turn! Available in four sizes! Chic frosted art glass combines with trendy color for a sophisticated look to honor any accomplishment. The clear glass art glass backer and base are frosted lightly to bring out the etched and color filled imprint. Mark Rosenbaum's skill is measured in the graceful shapes of his art which is combined with the mastery of the hot glass art craft. Rich amber colors are mouth blown on the end of a rod while the clear glass handles and base are added to the still molten shape creating this rich interpretation of ancient Grecian vase shapes. Each piece is hand made and signed by the artist. 20" x 9" x 7"